Peanut Butter Balls. No Bake Cookies. Sugar Cookies. Gooey Wonders. Peanut Butter Blossoms. I really could go on and on, but I think you get the picture... It's Christmas Cookie Week! 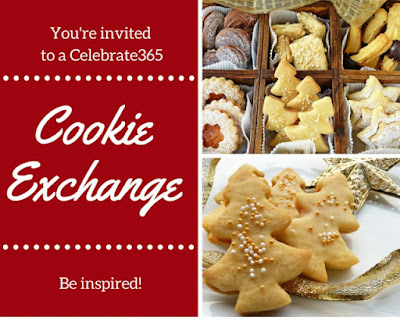 And to get things started I am partnering with my Celebrate 365 co-hosts (Carlee from Cooking with Carlee, Jan from Tip Garden, and Nicole from Tales of a Kansas Farm Mom) to host a Cookie Exchange Link-Up Party. All bloggers are welcomed and encouraged to link up their favorite Christmas Cookie recipes. I can't wait to see what everyone shares, as I love making a few different cookies each week in December leading up to Christmas, that way I have well rounded Christmas Cookie platters with lots of favorites and variety. Also, be sure to stay tuned for Christmas Cookie Week by following #ChristmasCookies on social media. I'm excited to be sharing a family favorite recipe tomorrow as part of the week long festivities, and a new recipe I created that is full of holiday flavor on Thursday! Be sure to follow along and check out the 130 recipes! What is your favorite Christmas Cookie? Be sure to link-up the recipe and Comment for a Cause! There are so many great cookies here already. I wish I could nibble on few while I peruse!